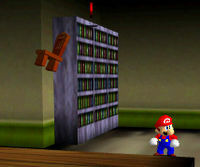 Chairs are enemies found in Super Mario 64 and its remake, Super Mario 64 DS, in the course Big Boo's Haunt. As their self-explanatory name suggests, they are wooden single-person chairs. There are only two total in the game, and they can be only be found in one room: the second door on the left, when entering the mansion from the front. When Mario enters the room and approaches one of them, the chair rises up into the air, rapidly rotates, comes to a stop and then hurls itself at Mario. The chair will continue flying in its projected direction until hitting the floor or a wall, at which point it will disappear. If it collides with Mario, he will lose two hit points. ↑ Scan of 「スーパーマリオ64必勝攻略法」 (Super Mario 64 Hisshō Kōryakuhō), page 19. This page was last edited on February 28, 2019, at 07:45.